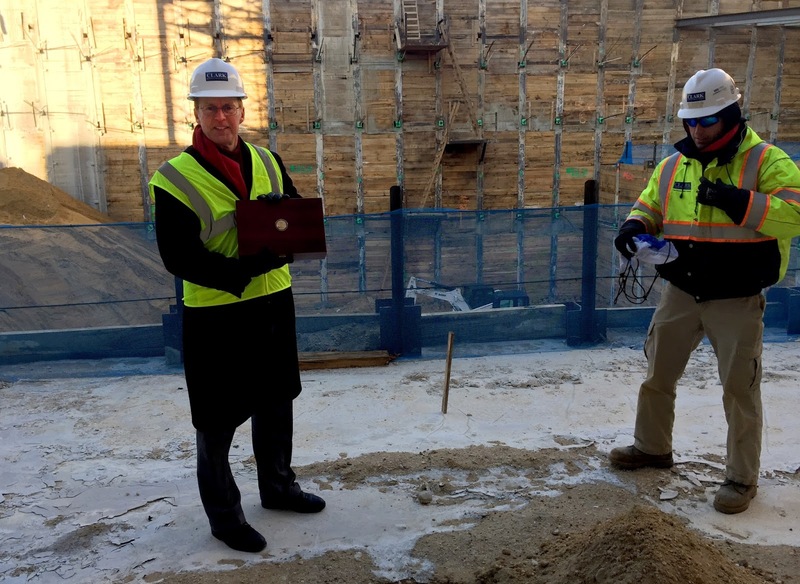 Braving temperatures in the teens, Memorial Fund President and CEO Craig W. Floyd climbed down 65 feet into the construction site of the National Law Enforcement Museum. Strapped to his back as he climbed down several ladders on this December day, was a wooden box containing rubbings of names of fallen officers from the Memorial across the street. The rubbings were part of a project from National Police Week in 2014. Visitors to the Memorial were asked to make extra rubbings of their loved one’s names so they could be placed into a capsule and embedded into the Museum underneath the area which will contain the Museum’s Hall of Remembrance. Hundreds of rubbings were collected and they waited for the day when they could be forever sealed into the foundation of the building designed to tell their profession’s story. That day came on December 15, 2016. Mr. Floyd carefully delivered the capsule to its final resting place. He gently placed the wooden box into the ground, and shoveled in the dirt on top. Concrete will soon be poured over the site as construction for the Museum continues. The Museum is expected to be completed in 2018.